Money in checking and savings accounts. Anything one spouse owned before the marriage or acquired after the couple separated. Gifts or inheritances received by one of the spouses that was deposited into an account held only by that spouse. Property received by one of the spouses as a gift or inheritance as long as it was held in that spouse’s name only and kept separate from all of the other marital property. Generally, separate property is not divided during divorce because each spouse just keeps his or her own separate property. Community debts are all debts incurred by one or both parties to the marriage from the date of marriage to the date of separation. Both spouses are responsible for the debts and liabilities, again, regardless of which spouse created the debt, or whose name is on the title, note, or bill. Examples of community debts are: balances on vehicle loans, mortgages, credit card balances, personal loans; student loans, medical bills, unpaid taxes, and other liabilities. How are Community Property and Debts Divided in Divorce? Community property and debts are usually divided equally (50/50) between the spouses. However, this equal division may not always mean a physical division. For example, the court may award each spouse personal property, assets, and debts whose worth adds up to his or her percentage. Personal Injury Settlement (except for part of the settlement that includes a claim for lost wages, which would be considered community property). Real Property taken by the parties as Joint Tenants with Right of Survivorship. When spouses take title to property as joint tenants, each spouse’s interest in the property is considered a separate property interest. Community debts extend to debts that either spouse incurred before the marriage dated, which continued throughout the marriage. However, the wages of one spouse can’t be garnished for the premarital debt of the other if the wagers were kept in a separate bank account to which only the earning spouse has access (www.courts.ca.gov). By entering into either a written prenuptial agreement or post nuptial agreement, spouses can agree not to have community property, or agree that only certain property will be community. The rents and profits of separate property owned by one of the spouses are considered community property. Property acquired after marriage if there is a prenuptial separate property agreement. Property acquired during marriage after a post-nuptial separate property agreement approved by a judge. Property acquired by a spouse with separate money. Damages from personal injury, worker’s compensation, etc. awarded to one spouse only, except damages for lost wages. Damages from a breach of contract against the other spouse resulting from the fraud or bad faith of the other spouse in managing community property. Louisiana Bar Association Community Property Brochure. Nevada Property acquired by either spouse from a gift, bequest, devise, descent or by an award for personal injury damages, with the rents, issues and profits thereof, is considered separate property. Nevada Revised Statutes 123.130. New Mexico Property is designated as separate property if it is through a written agreement between the spouses, including a deed or other written agreement concerning property held by the spouses as joint tenants or tenants in common in which the property is designated as separate property. New Mexico Statutes, Section 40-3-8. Property that is purchased with separate funds is considered separate property. Income derived from separate property is considered community property. A married couple can agree in writing that the separate property of one of the spouses will be community property. Separate property can be created by the spouses with a written agreement partitioning or exchanging community property. Income generated by separate property is considered separate property. By written agreement, spouses can change the character of their property (changing separate property into community property and vice versa). Washington RCW 26.16.010. Property designated as individual property (separate property) by a marital property agreement. The following income: (a) income to one spouse from a trust created by a third person, unless the trust provides otherwise; and (b) income attributable to property of a spouse, other than marital property, with respect to which the souse has executed a statement designating that income as his or her individual property. How is property divided in the rest of the states? The rest of the states not on this list do not have community property laws. 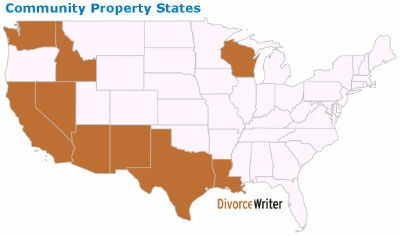 In these states, the property acquired during the marriage belongs to the spouse who earned it. When divorcing, the courts divide the property according to the concept of "Equitable Distribution," which means that property is distributed or divided equitably between each spouse. This doesn’t mean that each person will receive an equal share. There is no hard and fast rule in deciding who receives what or how much. In uncontested divorces, the spouses reach an agreement as to which spouse receives what property. In contested divorces, a judge may order a spouse to transfer separate property to his or her spouse to make the settlement fair for both spouses. Alaska Alaska is a state where the court usually divides property according to Equitable Distribution. However, Alaska adopted the Community Property Act in 1998, allowing a couple the choice of dividing their property according to the Community Property Act instead of Equitable Distribution. If the couple wants to divide their property under the Community Property Act, they determine what property is to be considered community property and what property is to be considered separate property by executing a Community Property Agreement or a Community Property Trust. When the couple divorces, the courts then divide the property according to the Community Property Agreement, instead of Equitable Distribution. Making Financial Decisions When Divorce Occurs a University of Idaho Cooperative Extension System guide.